Zomato today told its users that it was launching Zomato Gold, a membership program for what it called a “premium nightlife experience.” Zomato Gold would let customers pay a monthly membership fee, and get four drinks for the price of two at a selection of restaurants around them. There was a catch though – but not in the fine-print as is common in such offers. The service was launching in Abu Dhabi and Dubai; Zomato’s India users would have to wait until June. This is something that doesn’t happen every day on the Indian startup space – a homegrown company testing out a product on foreign shores before bringing it to its Indian audience. Zomato’s first announcement of the Gold service hadn’t even been in English. A week ago, it had published a blog in Portuguese announcing Zomato Gold’s arrival in Portugal. Zomato appeared to have had its eye on international markets before most of its Indian peers. It had forayed in Dubai all the way back in 2012, and had then carried out a string of acquisitions to quickly grow its international presence. In July 2014, it had acquired Menu Mania in New Zealand for a million dollars. Over the next six months, it would quickly acquire Obedovat from Slovakia, Cibano from Italy, Gastronauci from Poland, Lunchtime from the Czech Republic, and Mekanist from Turkey. Armed with a slew of small, local restaurant discovery sites from across the world, it then made its biggest acquisition to date. It acquired Urbanspoon in early 2015 for $55 million (Rs. 350 crore). Urbanspoon was based in America, and the chief competitor to the biggest restaurant discovery app in the world, Yelp. But Zomato wasn’t fazed by competition – it quietly wound down Urbanspoon, and started directing its traffic to Zomato.com. Zomato wanted to become a truly international brand. And the numbers show that it’s been successful in doing so – certainly by the standards of Indian startups. It recently became the 2nd most download downloaded app in the UAE, and incredibly, a majority of its users aren’t even Indian any more. 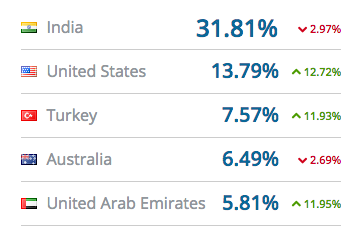 SimilarWeb says that a mere 31% of its traffic now comes from India. Its other top markets are the United States, Turkey, Australia and the United Arab Emirates. Other Indian companies have also made attempts to expand internationally, but none seem to have come close to the kind of penetration that Zomato seems to enjoy. In 2015, Redbus had announced that it was expanding to four south-east Asian countries, but still gets 90% of its website traffic from India. Oyo Rooms had made a much-publicized move into Malaysia, but 94% of its traffic is Indian. Practo, too had said that it was expanding to faraway Brazil, but India accounts for 86% of its traffic. Other Indian unicorns – the likes of Flipkart, Snapdeal, Paytm and Quikr – have been busy gaining a foothold in India to even consider overseas moves. But it hasn’t always been smooth sailing. Like most of its Indian startup peers, Zomato’s also been plagued by profitability problems. It was founded nearly ten years ago, but still netted losses of Rs. 492 crore last year. Its valuation had then been slashed in half by HSBC, effectively knocking it off its unicorn perch. In May last year, the Zomato had pulled out its physical presence from 9 international markets, including the high-revenue markets of US and UK. To control its burn rate, it had chosen to serve these markets remotely. But in spite of the missteps, Zomato’s international expansion is still chugging along. Unlike other unicorns, Zomato has the luxury of being the undisputed single biggest player in India, which gives it breathing room to move abroad. And it’s about time that India gets a truly global brand. Spotify was made in Sweden, which has a population of 95 lakh; Nokia phones are from Finland, which has a population of 54 lakh, and Skype was made in Estonia, which has all of 13 lakh people. Surely a country with 120 crore people deserves to have a truly global brand that it can call its own. And if Zomato can play its cards right, it might just get there.